The current debate over school discipline has largely centered on discipline policies. But data suggest that school characteristics that have gone unnoticed may impact suspension rates. In kindergarten through third grade, black boys in California are 5.6 times as likely to be suspended as the state average. A 2017 report by the Brookings Institution found that school size, grade configuration, and segregation correlate to suspension rates. Black males in California public schools are suspended at a rate 3.6 times that of the statewide average for all students, according to a 2018 report by three education professors at San Diego State University and the University of California, Los Angeles. While this comes as no surprise to those in the know, data suggest that certain factors affecting suspension rates have gone unnoticed, such as school size, a school’s racial makeup, and the way schools’ grades are structured — whether K-5, K-8, middle school, or high school. ● Among schools that suspend a disproportionate number of black students, school size tends to correlate with suspension rates. 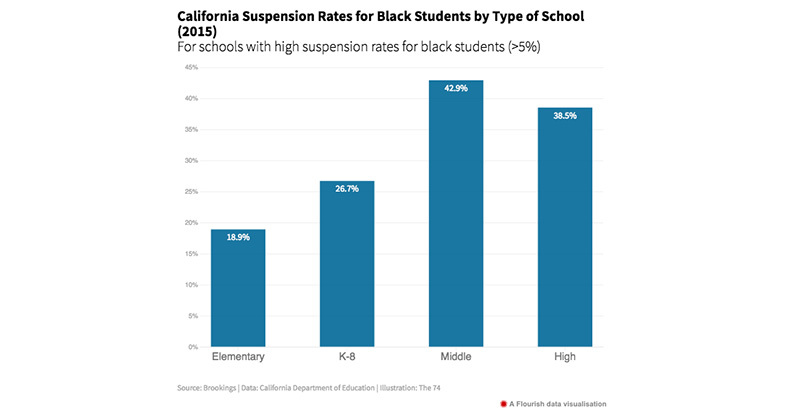 The rates of suspensions for black students went up as school size increased. ● Suspension rates for black students tend to peak in middle school and then fall in high school. ● Black students are more likely to be suspended when they attend segregated or “racially isolated” schools than when they attend majority-white or mixed-race schools. That debate is still playing out. Recently, a group of 80 educators and student advocates signed a letter urging U.S. Secretary of Education Betsy DeVos to keep the guidance President Barack Obama issued in 2014, which called on school districts to reduce the use of suspensions and take action to close the gap in suspension rates between white students and their black peers. Loveless’s research suggests there are factors within school districts’ control that impact suspension rates but have little to do with actual discipline policies. One factor is school size, particularly middle schools. Loveless noted that school size could be adjusted by reassigning students to different schools or building new ones. “That’s when kids get squirrelly. It’s just a few minutes, but it gives kids time to get in trouble,” he said. About 23 percent of schools where blacks make up 6 percent or less of enrollment were found to suspend black students at high rates. However, 48 percent of schools that have the largest enrollment of blacks suspend them at high rates. Again, the data don’t provide an answer as to why this is the case, but Loveless speculates that it could relate to the fact that segregated schools are more likely to be found in neighborhoods with layers of socioeconomic challenges like poverty and crime. These factors create trauma for students and could make them more likely to engage in disruptive behavior. Segregated schools may also be more likely to employ less experienced educators who don’t know more effective techniques of dealing with challenging students, or who take a more punitive, “no excuses” approach to discipline and suspend students who fall out of step with school policies. Loveless said that although characteristics like school size and, to a certain degree, segregation are within school districts’ control, school districts may be confined by financial and political constraints. “Any time you try to break schools up and reassign kids to new schools, you’re going to get political pushback,” he said. Suspension rates for black students may be at their highest in middle school, but the disparities start much, much earlier. Frank Harris III, a professor of postsecondary education at San Diego State University who helped produce the recent report on suspension rates for black boys in California schools, said he and his colleagues were shocked to discover that disparities emerge in early childhood. In kindergarten through third grade, black boys are 5.6 times as likely to be suspended as the state average. Harris and his team then set out to interview community college students, asking what brought them there. The trends haven’t gone unnoticed by California legislators and school district officials, whose actions at the state and local levels have helped California reduce suspensions by 46 percent since 2011. But even as suspension rates have dropped across the board, the discipline gap hasn’t narrowed in any significant way for black students. 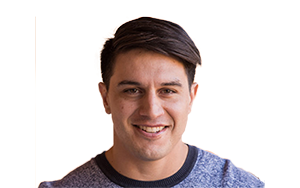 Still, Loveless said, he’d like to see educators and researchers broaden their views in the ongoing debate over school discipline and not look solely at policy.